Apogee Electronics has introduced Mike, described as “the most compact studio quality USB microphone available for iPad, iPhone and Mac”. Mike by Apogee is an extremely portable, easy-to-use and powerful microphone for use with GarageBand on your favourite iOS devices. Finally, you can capture your best take with incredible quality, wherever your music takes you. Record any sound you can imagine, from vocals to vibraphones, acoustic to lap steel guitars, pianos to percussion and everything in between, and build a track right on your iPad with GarageBand. With the unique flexibility to also plug Mike into your Mac, the possibilities of recording are endless. 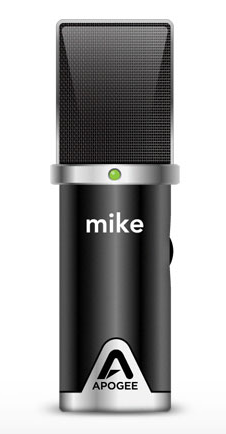 Pricing and availability for the Apogee Mike are to be announced. I have the apogee one it’s very noisy when using it for instruments and decent for using the mic – this Mike would be great if we can use two in stereo- I am willing to give it a chance.